Made by Raby, Edward, c. 1900. Large porcelain vase with a dark rose-pink glazed body with painted decoration of yellow and white roses in foreground with taller lilac blue [anemones] in background. Solid decorative gilded banding around the neck of vase extending onto body of vase in scrolled, leafy swags. Referred to in John Shorter catalogue as the ‘Luscian Raby Vase’ and ‘Luscian Rose Vase’. Large porcelain vase with a dark rose-pink glazed body with painted decoration of yellow and white roses in foreground with taller lilac blue [anemones] in background. Solid decorative gilded banding around the neck of vase extending onto body of vase in scrolled, leafy swags. Referred to in John Shorter catalogue as the 'Luscian Raby Vase' and 'Luscian Rose Vase'. Edward Raby was an artist who painted on delicate porcelain such as Royal Doulton vases during the early 1900's. Edward Raby was one of Doulton's most talented painters. Roses were his forte. 'To posses a Doulton vase adorned by one of these gems of colour by Raby is to hold a treasure of ceramic art' noted a contemporary observer. 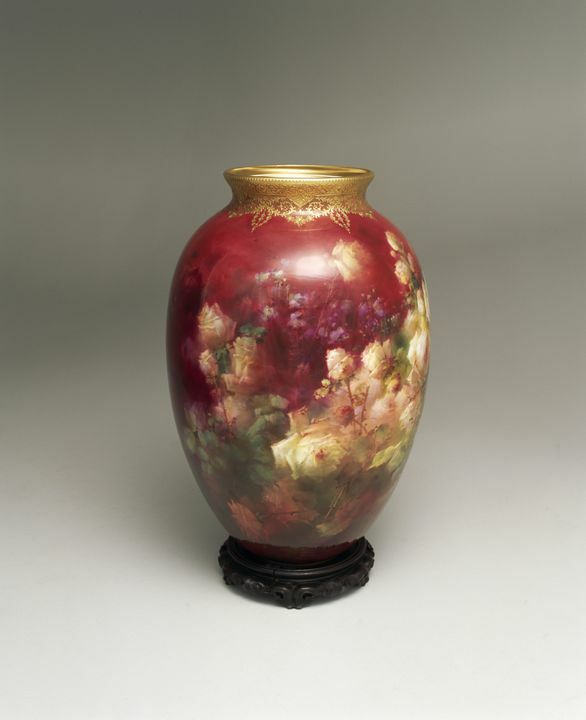 Part of a fabulous Doulton Collection gifted by John and Arthur Shorter in 1932, this unique vase was once displayed, lit with an internal light source - in Doulton's shop window in Melbourne. After making mostly utilitarian stonewares and sewer for over 20 years, the London (Lambeth) pottery Doulton & Co set up an art studio by 1871. The new 'art wares' designed by students and artists from the nearby Lambeth School of Art soon drew crowds at international exhibitions, including Sydney's 1879. In 1882, Henry Doulton invested in a second pottery at Burslem (Stoke-on-Trent), Staffordshire, where innovative ceramic bodies, glazes and styles were developed well into the 20th century. These objects, once described as 'rare triumphs of the master potter', are part of the Museum's large collection of early ceramics by Doulton (Royal Doutlon since 1901) - one of the finest in the world.